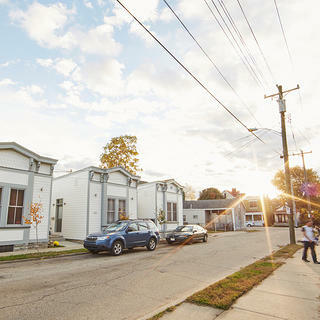 A row of rehabbed shotgun houses in Covington, Kentucky, fosters a sense of community. It’s a sunny Saturday morning on the west side of Covington, Kentucky, and the kids are feeding leftover Brussels sprouts to a flock of chickens at a community garden. Several neighbors stop by for cartons of eggs; others pick the last of the hot peppers from the half-acre space. Mothers push baby carriages along the sidewalk and pause to chat. Across the street, Stephen Huss stands outside his circa-1890s shotgun-style home and shakes his head in wonder. If you had told Huss just 10 years ago that there would be a chicken coop—a chicken coop!—and vegetable plots across the road, he wouldn’t have believed it. Back then, Orchard Street was a haven for prostitutes and gang members. Ramshackle houses, standing where the chickens now roam, were home to a notorious clan of drug dealers, and the five other wood-frame shotgun homes adjacent to the Huss residence, all in various stages of decay, accommodated an ever-changing assortment of tenants, squatters, or no one at all. One house was so leaky, recalls Huss, that someone was living out of a tent inside. 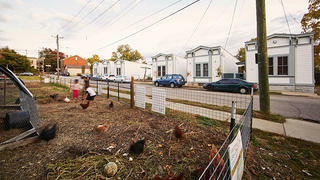 What surprises Huss even more than the chickens is that those five homes next to his—now touted by Covington city planners, along with his own house, as Shotgun Row—have been completely rehabilitated, with gingerbread cornices restored; new cement-board siding painted a cheery white; and interiors modernized, some with hardwood floors, granite countertops, and dangling halogen lamps. 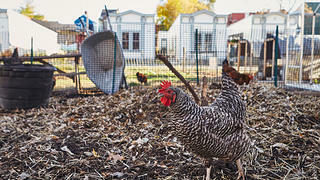 A Plymouth Rock chicken struts in the community-run coop across the street from Shotgun Row. 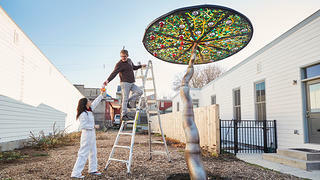 Artists David Rice and Ybette Inojosa of the Westside Action Coalition put the finishing touches on a metal sculpture they designed for Shotgun Row’s pocket park. Orchard Park Urban Farm Project, the community garden and chicken coop across from Shotgun Row. Mary Pat and Tony Noll in their kitchen. It was sometime around 1890 that Henry G. Haver, a foreman at the local wire works, bought a parcel of land along Orchard Street and built seven shotgun-style homes, one room wide by three or four rooms deep. (One of the houses burned down in the 1990s.) They were more ornate than the typical shotgun, with basements, high ceilings, Italianate cornices, and two tall windows on the street-facing side. Haver moved his family into one and sold the others, likely to laborers either at the wire works or at the nearby lumber mill, rope works, or Bavarian brewery. At the time, Covington was the industrial hub of Northern Kentucky, and it remained that way until the economy collapsed during the Great Depression. During the ensuing years, migrants from Appalachia flooded the city looking for work that often wasn’t there, and during the next several decades many of the city’s grand homes were divided into apartments. By the 1960s and ’70s, urban flight left many buildings vacant, particularly in the city’s Westside neighborhood. Crime skyrocketed, and during the mid-2000s, the police were averaging almost 1,500 calls for service to the neighborhood every year. Orchard Street, which was the scene of two murders in 2004, was practically its epicenter. But the block was part of the Lee-Holman Historic District—one of 17 protected areas in Covington—and had its share of historic structures, including Haver’s unique row of shotgun homes. Enter the Center for Great Neighborhoods and Sarah Thompson Allan. Allan, an energetic 41-year-old with an MBA in economic development, has a knack for seeing the potential in woebegone structures. While working for a community development corporation in Philadelphia, she had helped successfully revamp a 19th-century textile mill into space for artists. She and her husband had even completed their own historic resurrection: transforming a dreary 1930s former brake shop into a retro-cool home. While working with the Center to restore other buildings around Orchard Street, she says it was hard to ignore this “eyesore block in the middle of everything.” But it was the longest row of shotguns in the entire city—something worth preserving—and the homes might just appeal to young, creative types willing to take a chance on a struggling neighborhood. In 2012, the Center received a grant from the Kresge Foundation to transform the structures into live-work spaces for artists. (“Artist” in this case is defined as anyone involved in a creative pursuit.) Over the course of the following year, the Center purchased three of the vacant houses from the city and two from private owners. The Husses wanted to stay, so Allan and her colleagues agreed to furnish a new roof and matching siding in order to preserve the visual continuity of the row. And then the heavy lifting began. When staff from the Center finally had the chance to assess the buildings, they realized they looked just as bad—if not worse—from the inside as they did from the outside. For Kevin Kluender, an architect with the Cincinnati firm Drawing Dept., trying to re-create the homes’ original Victorian-era facades was like assembling a jigsaw puzzle. “There wasn’t a single building that was 100 percent intact, but if one was 75 percent intact, another would have the lacking 25 percent, so we could kind of mash things together,” he says. And while the facades could be restored to their original designs, the interiors were simply too far gone. Construction crews were able to preserve the brick fireplaces in three of the five homes, but the decision was made to update everything else, both because of the interior conditions and in hopes of appealing to contemporary tastes. 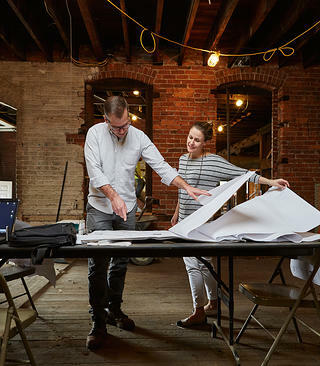 Adam Rockel and Sarah Thompson Allan of the Center for Great Neighborhoods review project plans in their under-construction headquarters. Peggy Munson leads a yoga class in her home’s front-room studio space. By the summer of 2014, the model house at 323 Orchard St. was ready to be shown. And then two unexpected things happened: First, the homes, which started at $90,000 each, were all pre-sold within a matter of months—long before construction had even been completed. Second, instead of young creative types snatching up the properties, all but one went to buyers who are over 50. Allan says the project’s success proves there’s a market for the oft-maligned shotgun house, a narrow, linear design that hasn’t been in favor since the Hoover administration. (Some believe the name originated from the fact that a bullet fired from a shotgun could travel straight through the house from front to back, while others attribute it to the evolution of the African term “to-gun,” which means “place of assembly.”) “Our hope is that shotguns can be repurposed in a way that they become an option for people who want to age in place,” says Allan. She notes that the one-floor structures are also perfect for people who, like two of Shotgun Row’s current residents, have mobility challenges. With a rich history dating to its early role as a trading center along the Ohio River, Louisville contains a remarkable collection of historic structures and older neighborhoods.